Solar energy, the world’s cheapest and fastest-growing power source, could one day supply most of the world’s energy needs. In Taming the Sun, however, Varun Sivaram warns that solar’s current surge is on track to stall, dimming prospects for averting catastrophic climate change. Brightening those prospects, he argues, will require innovation—creative financing, revolutionary technologies, and flexible energy systems. Solar energy, once a niche application for a limited market, has become the cheapest and fastest-growing power source on earth and its potential is nearly limitless—every hour the sun beams down more energy than the world uses in a year. 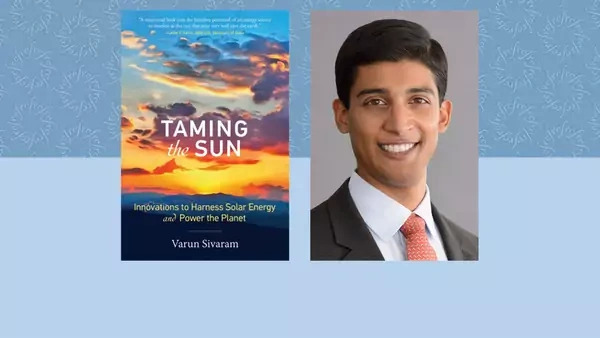 However, in Taming the Sun: Innovations to Harness Solar Energy and Power the Planet, Varun Sivaram warns that the world is not yet equipped to harness erratic sunshine to meet most of its energy needs. Furthermore, if the current surge in pursuing solar peters out, prospects for replacing fossil fuels and averting catastrophic climate change will dim. Drawing on firsthand experience and original research spanning science, business, and government, Sivaram explains how innovation can brighten those prospects. Financial innovation is already enticing deep-pocketed investors to fund solar projects around the world, in the sunniest deserts and poorest villages. Technological innovation using artificial photosynthesis to store intermittent sunshine could replace today’s solar panels. Finally, systemic innovations could add flexibility to the world’s power grids and other energy transport systems so they could dependably channel the sun’s unreliable energy. Unleashing these innovations will require visionary public policy: funding researchers developing next-generation solar technologies, refashioning energy systems and economic markets, and putting together a diverse clean energy portfolio. Although solar is a variable resource and can’t power the planet by itself, it can be the centerpiece of a global clean energy revolution. What can we learn from solar technology’s history in the United States and how government policies have affected its development over time? How have Japan, India, and Mexico’s energy policies and bullishness on solar technology benefitted each country? Is their optimism warranted, or could their optimism be harmful? Chapter 5 discusses the “double-edged sword of public intervention.” How can governments not impede innovation and progress while protecting their domestic industries and interests? What policies could have shielded innovative solar companies in the United States from an influx of cheaper Chinese solar PV panels? Would these policies be more valuable than the price decline in solar panels resulting from Chinese exports? What is “technology lock-in” and what policies can be employed to avoid it? What policies or innovations could counteract the potential value deflation of solar as more becomes connected to the grid? How could the government encourage investment in solar power necessary to meet the Paris Climate Accord goal of limiting climate change to 2ºC? What role, if any, should government play in solar innovation (technological, financial, and systemic)? What policies are most conducive to such innovation? What are the causal differences between the two futures outlined in Chapter 1? What future is in store if only some of these conditions are fulfilled? The “brighter future” referenced in Chapter 1 involves solar, wind, and carbon capture technology on fossil fuel powered plants. Can climate change be mitigated without these technologies, or is solar enough? What are some weaknesses of current solar technology? Why would connecting enough solar panels to the grid to power a city not immediately eliminate carbon emissions? How can we address this weakness? Some developing nations view emissions limits as unfair to their development prospects: developed nations have industrialized and grown without regard for the environment, and now are asking developing nations to incorporate potentially costly environmental-friendly considerations into their development strategies. Can off-grid, microgrid solar systems, and new solar technologies help these nations develop without increasing emissions? What is “technology lock-in” and what threat does it pose to combating climate change? Why is developing a solar-derived fuel to store energy important to limiting carbon emissions? What is restraining the development of marketable solar fuels, such as solar-made hydrogen? How can public policy encourage the innovation necessary for a thriving solar sector? Is the current administration taking these measures? What role does solar technology play in combating climate change? Are we taking the necessary steps in solar to limit the global temperature increase to 2 ºC? If not, what should we be doing? Why hasn’t nuclear power become the dominant energy source? Discuss the relative importance of accidents, public backlash, and technological stagnation in its failure to meet expectations. How has solar technology changed since its inception? What has been stopping it from advancing beyond silicon PV panels? How can we address the issue of intermittency in solar and wind technologies? What innovations or policies could help to prevent crises whenever the sun is blocked? What are the advantages and disadvantages of perovskite over silicon solar cells? Why aren’t solar PV manufacturers more seriously considering it, and what lessons can be learned in trying to bring innovative technologies to market? What factors limit the efficiencies of solar materials and panels? Can we address these factors through technological innovation? Why is technological evolution more effective for innovating at market scale than revolution? Consider the impact of technology lock-in. Concentrated solar power (CSP) is promising in utility scale solar. What makes it a better fit than solar PV and what promise does it hold for energy storage, or mitigating intermittency issues? Chapter 8 asks “is bigger better?” Is it feasible or even desirable to expand the grid to maximize solar use, decentralize generation and consumption, and make the grid smarter simultaneously? Which factor is most important? Why might battery storage not be the solution to saving excess solar power for hours when the sun isn’t shining? What alternatives, if any, exist to power the entire grid consistently? Write an 800-word opinion piece advocating a U. S. policy that could advance innovation in solar or another renewable industry, or a policy that strives to limit carbon emissions. The policy need not be a real piece of legislation, but be sure to consider political pressures in deciding your policy. Write a 2,500 to 4,000-word essay based on arguments presented in Taming the Sun as well as your own research in response to one of the following topics. Analyze one country’s (preferably not the United States) energy policy and its attempts to reduce emissions and transition toward renewables. Using what we have studied in this course, evaluate their policies’ effectiveness historically and, using case and policy studies, determine how their policy could be improved to encourage innovation and reduce emissions. You are managing the account of a major institutional investor (pension fund, mutual fund, or endowment). Write a paper outlining the risks and potential rewards of investing in renewable technology infrastructure. Draw upon data from current major renewable projects, as well as investments that institutional investors generally make. Should your client invest? Climate change remains a controversial topic in American politics. Write a policy brief to your representatives outlining benefits that investing in renewable technology could or would yield (think especially of potential economic and defense benefits). Given the sensitivity of climate change as an issue, you may employ arguments related to air and water quality such as the direct quality-of-life effects. As a group, select an emerging innovative solar technology (perovskite, organic solar, quantum dots, solar fuels) and prepare a presentation for the class about the potential of the technology, including its advantages and disadvantages vis a vis silicon PV. In doing so, investigate the feasibility, cost, efficiency, potential for incorporation into current solar technology (evolution), current stage of development, and any other pertinent factors. Gretchen Bakke, The Grid: The Fraying Wires Between Americans and Our Energy Future (New York: Bloomsbury USA, 2017). W.B. Bonvillian and C. Weiss, Technological Innovation in Legacy Sectors (London: Oxford University Press, 2015). Lester R. Brown, The Great Transition: Shifting from Fossil Fuels to Solar and Wind Energy (New York: W. W. Norton & Company, 2015). Peter Fox-Penner, Smart Power: Climate Change, the Smart Grid, and the Future of Electric Utilities (Washington: Island Press, 2010). Richard K. Lester and David M. Hart, Unlocking Energy Innovation: How America Can Build a Low-Cost, Low-Carbon Energy System (Cambridge: MIT Press, 2013). Meghan L. O’Sullivan, Windfall: How the New Energy Abundance Upends Global Politics and Strengthens America’s Power (New York: Simon & Schuster, 2017). Varun Sivaram, “Unlocking Clean Energy,” Issues in Science and Technology, Winter 2017: 31-40. Varun Sivaram, “Perovskite Solar Cells Could Beat the Efficiency of Silicon” Scientific American, July 2015.